never underestimate the power of a stupid sign. this sign was visible in the vintage sign bin at our local hardware store and it quickly caught my eye, with the gun and the crazed/fearful? folks. i suppose i was thinking about tragic sandy hook elementary school shooting when i stopped and took a long look. try as i might i couldn’t figure out what the saying in the sign was supposed to mean. 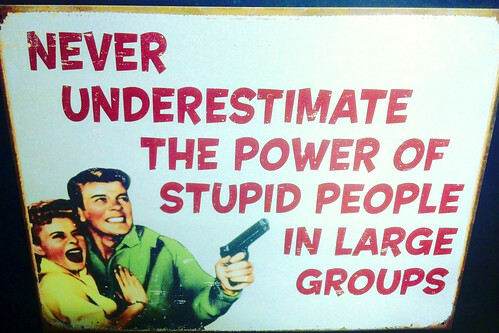 is the gun wielding dude and the woman in the sign the “stupid people” you shouldn’t underestimate? or are they protecting themselves from the stupid people?